Artist concept of 2018 VG18 "Farout." By Roberto Molar Candanosa/Carnegie Institution for Science. Scientists this week announced that they have found another distant body in our solar system. 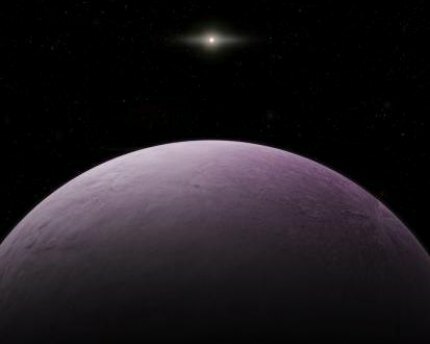 This is the first known solar system object detected at a distance of more than 100 times farther than Earth is from the sun, according to the Carnegie Institute for Science. To put in perspective just how far out this object is, consider that the measure used to describe distance in space is known as an "astronomical unit." One astronomical unit is the distance between the Earth and the sun. This object is at about 120 astronomical units, about three-and-a-half times more distant than Pluto. The second-most-distant object observed in the solar system is Eris, at about 96 astronomical units, according to Carnegie. The team has been searching for distant solar system objects in an attempt to confirm the presence of Planet Nine. They do not know the new object's orbit yet, however, and it is too early to say whether this is Planet Nine. Images of 2018 VG18 were taken at the Japanese Subaru 8-meter telescope on Mauna Kea in Hawaii, Nov. 10. It was seen a second time in early December at the Magellan telescope at Carnegie’s Las Campanas Observatory in Chile. The same group of researchers announced the discovery of another solar system object, called 2015 TG387 and nicknamed “The Goblin,” because it was first seen around the time of Halloween.